In a recent Cell publication, former JCC Fellow Hyun-eui Kim reported that lipids coordinate a stress response implicated in neurodegenerative diseases, such as Huntington’s. And if the lipid pathway can be effectively manipulated with drugs, the results point toward future treatments for such diseases. Normally, our cells have methods to prevent proteins from folding improperly and fixing them when they do. These processes, known as protein folding stress responses, become less efficient as we age. Abnormal, misfolded proteins can build up in and around brain cells, forming plaques that lead to the mental problems and death associated with neurodegenerative diseases, such as Parkinson’s, Alzheimer’s, and Huntington’s. For this study, Kim and her colleagues started with a nematode C. elegans that models Huntington’s disease and altered its mitochondria in a specific way. They observed that the worms grew fat and the change prevented the accumulation of misfolded proteins. Cultured human cells affected by Huntington’s disease responded the same way. In separate experiments, diseased worms and human cells were treated with a drug that affected with the storage of lipids, making more fat available. This also prevented the the accumulation of misfolded proteins. The reason? 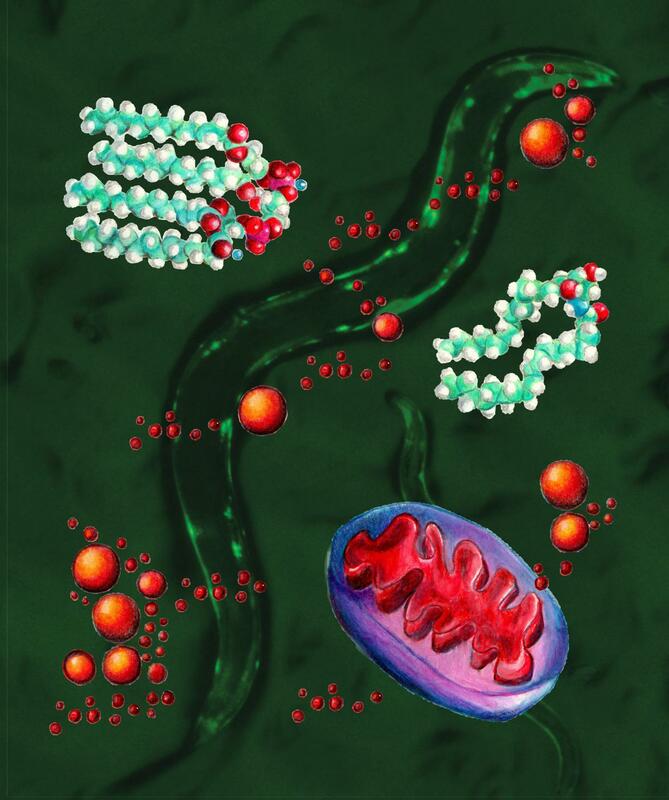 A specific lipid helped turn on protective genes. Two aspects of the results surprised Kim the most: that the mitochondrial stress response was the only such response that communicates with the rest of the cell, and that lipid metabolism was involved.